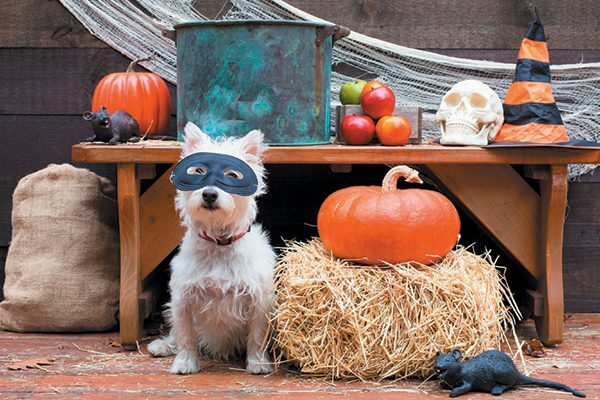 The post Ideas for a Dog-Friendly Halloween by Heather Marcoux appeared first on Dogster. Copying over entire articles infringes on copyright laws. You may not be aware of it, but all of these articles were assigned, contracted and paid for, so they aren’t considered public domain. However, we appreciate that you like the article and would love it if you continued sharing just the first paragraph of an article, then linking out to the rest of the piece on Dogster.com. For grown-up goths and those with a (usually hidden) dark side, Halloween is the greatest holiday of the year. We get to dress up as whomever we please and eat candy guilt-free. What could be better? Well, ask any dog lover and they’ll tell you: Even the best night of the year is better when you have a dog by your side. If a night without your dog sounds like a nightmare (Eeek! ), we’ve got some ideas for a dog-friendly Halloween. Stock you canine Halloween party with treats for pups. Photography ©peanut_roaster | Getty Images. Celebrating this spooky night with a handful of your closest canine pals (and their humans, of course) is a great way to get in the social feeling of this spirited holiday without taking your dog out into streets overflowing with overstimulated trick-or-treaters. Kids on sugar can be scary for dogs, but a backyard filled with fur friends is always welcome. If you’re planning to light jack-o-lanterns, display them high enough that wagging tails won’t knock them over, or, better yet, swap the traditional tea light candles for a more pet-safe LED mini light. Stock your bash with treats for the pups (like the ones in the sidebar) and a trickle of wine for the humans, and you’ll all be howling at the moon long before midnight. They’re kind of creepy and yet kind of cute — plastic dog skeletons are a hot Halloween item for retailers in recent years, with Frontgate, Home Depot, Amazon and other stores offering different styles and breeds. But beware: Chew-happy pups may find those plastic bones irresistible, so keep these decor items out of reach unless you want your chewer to go faux-cannibal on his plastic counterpart. Find a breed-specific stencil for your pumpkin. Photography ©Missing35mm | Getty Images. If you believe plastic dog skeletons belong in veterinary schools and not your living room, use your DIY skills to make some less frightening dog designs. 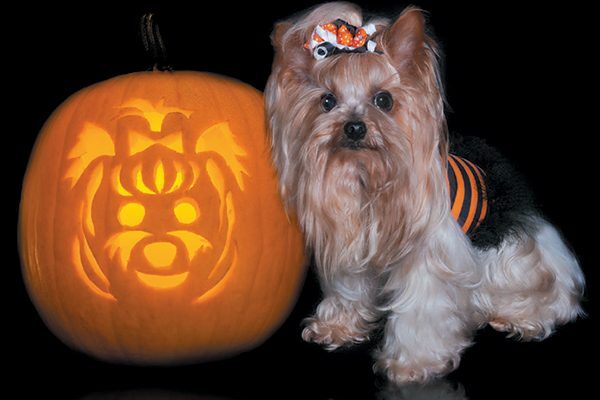 Pumpkins aren’t just good for a dog’s digestive system, they also make a pretty good canvas for a canine portrait. If you’d rather cut paper than pumpkins, breed-specific cookie cutters make a great stencil. Make a bunch of pooch-shaped cutouts on plain white paper, and you’ve got a pack of dog ghosts you can leash along a length of ribbon, or fix to walls or windows with double-sided tape. Use a Sharpie to add bones, and your phantom pups are transformed into chilling canine skeletons. GSD Nixe became an internet sensation when Bryn Anderson posted a pic a few years ago. Photography ©Courtesy Bryn Anderson. Instead of creating a Halloween masterpiece in your dog’s image, why not turn your dog herself into a decorative Halloween masterpiece with a little nontoxic, pet-safe paint? Bryn Anderson’s dog, Nixe, is known around the internet as the “original skeleton dog,” after a picture of the German Shepherd Dog sporting some spooky makeup went viral thanks to Reddit a few years ago. Bryn painted her first design on Nixe in just 15 minutes using organic, nontoxic makeup, and she suggests that decorating a dog in such a way can be a fun way for well-trained dogs who aren’t into costumes to participate in Halloween dress-up. Over the years, the duo’s designs have gotten increasingly complex, and Nixe usually just sleeps while Bryn paints her fur. Bryn says having a solid “stay” command is key before attempting a project like this unless you want to be the one wearing the paint. “Get them used to it a little bit, practice painting them with water and a brush, just to make sure they know the sensation, and practice,” she says. Bryn typically brushes Nixe’s fur with a liquid makeup that wears off very quickly but suggests Halloween-loving dog lovers might want to try Pet Paint, a spray product, for a longer-lasting design and easier application. Abe Geary is the founder of PetPaint. 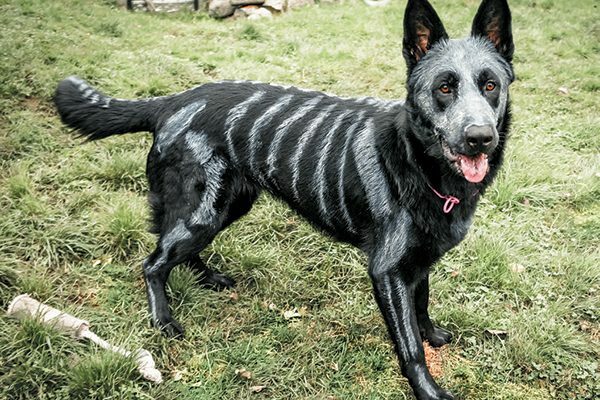 He says the colorful, pet-safe spray paints make for easy Halloween decorating because users can reapply on stencils to paint their dog’s design. “It’s temporary,” Abe says. “Essentially, it’s a better, safer version of the colored hairspray that you use on your kids or yourself.” Abe says it’s best to get dogs used to the sound of the spray bottle before attempting to give them some Halloween hair, and both he and Bryn stress that, of course, only dogs who are comfortable with being decorated should be. If your dog is up for being painted, a skeleton design or some tiger stripes could help him feel festive at your pup-friendly Halloween bash. Abe adds that decorating your pet with paint is a great way to turn a Halloween accessory, like a bandana or a pair of wings, into a full look, without having to put your pup in a costume. Some dogs, like Nixe, would much rather wear paint than clothes. Halloween is fun, but a dash of dog makes anything better, and the spookiest night of the year is no exception. Tell us: What are your plans with your dog this Halloween? Will your dog dress for the occasion? What are your tips for having a dog-friendly Halloween? Heather Marcoux is a freelance writer and two-time dog mom to GhostBuster and Marshmallow. Despite their movie-inspired names, Heather’s dogs aren’t in any web series — but they are on the web as the @ghostpetson Instagram. You can find Heather on Twitter.